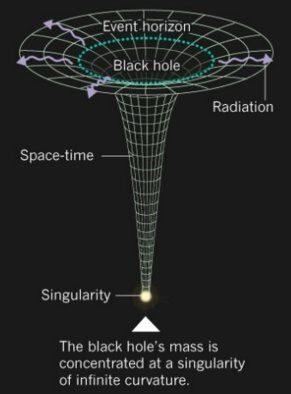 Towards a Unified Physics Theory - "The Theory of Everything"
What falls in a black hole is recorded on its surface: “quantum pixels” on an information-storing “holographic plate”. 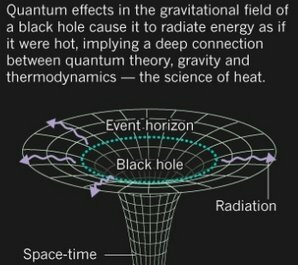 Particle falls in black hole (particles carry mass and are coupled to gravity) : graviton added on the horizon of the black hole. Charged particle falls in black hole : photon added on the horizon of the black hole. "The horizon of a black hole has the weird feature that it’s a sphere and it’s expanding outward at the speed of light. For every point on the sphere, there’s a light ray. So it’s composed of light rays. But it doesn’t get any bigger and that’s because of the force of gravity and the curvature of space. And, by the way, that’s why nothing that is inside a black hole can get out—because the boundary of the black hole itself is already moving at the speed of light." "Now the horizon of a black hole is a three-dimensional surface. There are the two angular directions around a sphere. And then there is the timelike direction, which is actually lightlike because the horizon is moving at the speed of light. And that lightlike direction has a boundary. If you go to the end of those light rays there’s a boundary. And that boundary is where the hologram lives. So the soft photons or gravitons—when you add them to the black hole—they can be thought of as living at that boundary." 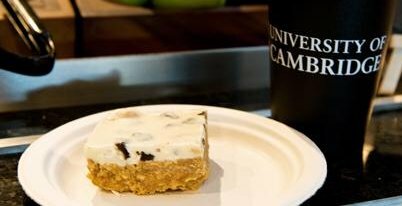 Excerpts from this Scientific American talk (+transcript). @SteveMirsky interview on @gmusser book "The Complete Idiot's Guide to String Theory"
(Both are Scientific American contributors). Steve: What does that give you other than a felicitous kind of aesthetic feeling about the universe, that it's all connected together in some kind of unified whole? George: For instance, the forces that may have caused the universe to expand very early in the history of our universe—they seemed to require a force that lacks direction; it has no directionality to it. It's called a scalar field in the jargon and that's precisely the kind of thing you might get from an extra dimension. You would get a directionless type of force acting on you. Such type of things string theory might give you. 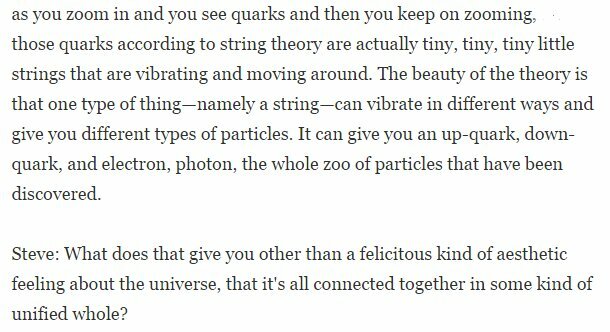 I should point out that there are other explanations for scalar fields as well, but string theory does seem to give those naturally to you. Steve: Well, so let's review: just basically string theory says that there are many dimensions that we're not aware of in our three-dimensional world of perception and that all the fundamental particles are actually tiny little strings that are vibrating in different ways from each other. "In the mid-1990s string theorists such as Joseph Polchinski of the Kavli Institute for Theoretical Physics at the University of California, Santa Barbara, realized that their theory predicts more than strings. It also implies the existence of “branes”: surfaces to which strings stick like bugs on flypaper. These membranes represent a vast kingdom of physics, beyond the high-energy particles the theory originally addressed. What looks like a particle—a mere point—to us might actually be the end point of a string stretching from a brane through a higher spatial dimension. We can view the universe either as made up of point particles moving in a four-dimensional spacetime with a complex set of interparticle interactions or as made up of strings moving in a five-dimensional spacetime attached to branes." The link between Condensed Matter Physics and String Theory: When electrons form a crowd, search how the strings are pulled ! Until recently we considered the following classical phases: plasma, gas, liquid and solid. The difference between the phases comes from features of the collective behavior of the atoms and specifically their arrangement which is linked to their motion (described by Newtonian mechanics) which is linked to their temperature. The notion of Quantum phases has been introduced. What happens if you provide energy e.g. by applying a voltage, by providing an electric current? The swarm of electrons can have different behaviors: move with difficulty if not at all e.g Teflon which is called an insulator, move with ease or low resistance e.g. metal like copper which is called a conductor or move with almost no resistance at all as is in the case of superconductors. The main idea needed to explain these behavior is entanglement described by Einstein, Podolsky and Rosen. How does space look like? "On incredibly tiny scales -- 10-33 centimeters, or smaller than a trillionth of a trillionth of the diameter of an atom -- space-time becomes jagged and discontinuous. At those scales, Dr. Ashtekar said, space dissolves into a sort of polymer network, ''like your shirt,'' which looks continuous from a distance but is actually made of one-dimensional threads." The equations that resulted were later shown to predict the polymers by Dr. Ashtekar, Dr. Carlo Rovelli of the Center for Theoretical Physics at the University of Marseilles in France and Dr. Lee Smolin of Pennsylvania State University. His first step was to express Einstein's equations in terms of variables with a chirality, or ''handedness,'' in which a circle drawn in the clockwise sense would look different from one drawn in the opposite sense. Against all intuition, Einstein's equations, which show no preference for direction, broke into simpler pieces in the Ashtekar variables. ''At one level, it was simply a redefinition of variables, which one might think was a fairly minor thing to do. But it really rejuvenated the whole field and caused quite an explosion of activity,'' Dr. Isham said. Soon there followed the solutions showing the polymerlike structure of space. (...) So to figure out the area inside a circle in this weird space, one would count up the strands that puncture its surface and multiply by the quantum of area carried by each of them. In this way, area is not smooth but comes in bundles. The same rule holds for the area of a black hole's event horizon, the place beyond which anything is drawn into the black hole. Last year (1998) Dr. Ashtekar, et al showed that the polymers running into a black hole in a sense hold it ''still'' at the puncture points, like a water balloon supported on blunt pins. The rest of the horizon is free to jiggle about quantum mechanically. Like the bouncing and jiggling of atoms in an ordinary gas, such motion has a definite entropy (or randomness) and therefore a temperature. "If I take this shirt, and I take a magnifying glass, I can see that the shirt is fundamentally one-dimensional, because the threads are one-dimensional. 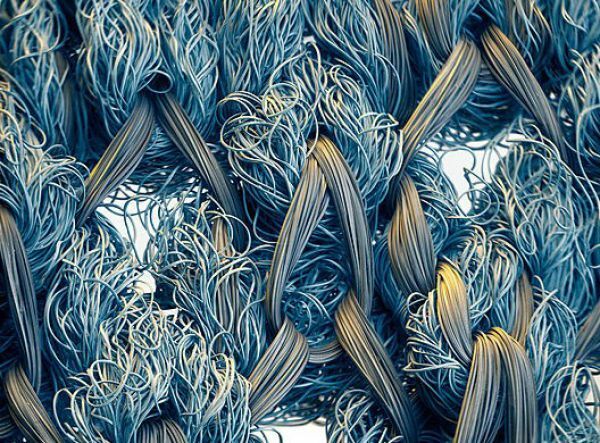 It’s just that those threads are so densely packed that I get an illusion that it’s two-dimensional. What comes out in loop quantum gravity is that the geometry of space is like that. It’s woven by these one-dimensional fibres, it’s like a polymer. But this polymer is so intricately woven and tightly spaced that we get this illusion of continuum. It’s coarse-graining." What happens if you run a Bing Bang simulation/ a cosmos simulation backwards or a black hole simulation back from its horizon? Will you get the Bang or the singularity? Answer: You will get a Bounce and a tunnel to another cosmos, to another part of space. 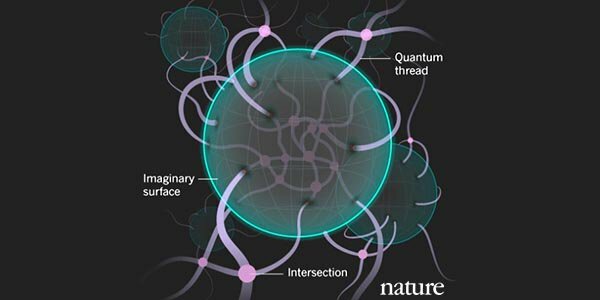 Excellent article by Nature journal with milestones towards a #UnifiedPhysicsTheory. On the constituents or "atoms" of the Space-Time Fabric. "a macroscopic average over the motions of myriad atoms and molecules"
"a macroscopic approximation to the unseen constituents of space and time"
Notes on article by Zeeya Merali published in the journal Nature. When entropy increase is reflected on increase of surface. A holographic paradigm. What happens when a black hole devours matter? Stuff is homogenized, reduced to particles. More particles in a ballon? Increase of volume? Increase of entropy? Scientistist tells us increase of the surface of its horizon. Increase of entropy proportional to the increase of its horizon surface. What is inside, in a 3D space, in a volume is represented on a 2D surface? What is this 2D surface? It is space-time. What are the elementary components of space-time? Let us take points with some properties. That will be points similar to “black hole horizons” whose area increases with increase of entropy. If you solve the math with thermodynamics you get Einstein equations on relativity and gravity. What are the elementary components of space-time? What are its atoms? The Stefan–Boltzmann law tells us that a black body emits radiation which is only dependent on its temperature. Stephen Hawkings tells us that something similar applies to black holes. They send out radiation and this black-body type radiation has been termed Hawking radiation. Let us introduce in the discussion the notion of entropy. Let us consider a rotting vegetable or fruit. The highly-organized biological structure is broken down, is homogenized to an amorphic mass which corresponds to poorly organized structure. Molecules that were highly organized are now loose and disordered. We say that the entropy of the system is increasing. It has been proven that black holes have entropy. A black hole due to its intense gravitational force attracts everything in its vicinity. Nothing can escape, not even light. What happens to the stuff it devours? What would we anticipate for an increase of molecule, atom, in general particle number? An increase of volume. Scientists tell us that, that what increases is the surface area of its event horizon, the boundary out of which nothing can escape. The increase of the entropy of the black hole is proportional to the increase of the surface of its event horizon. Is it a case of what is inside, in a volume or 3D, being represented on a surface, on 2D? That is similar to 3D object represented on 2D holographic film. What a black hole eats (inferred to correspond to 3D volume) increases its surface horizon (2D)? Let us try to approach the question: If space-time is a fabric which are its elementary components? Let us consider points. What are the properties associated with this points? Ted Johnson in 1995 considers points similar to “black hole horizons” whose area increases with increase of entropy. The math with thermodynamics yields Einstein equations on relativity.